Building construction sites are very dangerous and risky place to work. Accidents/Incident and even death may happen at construction sites anytime but using our common sense mostly of these hazards are preventable. Let's discuss about one major accident happening at site is the Fall From Height. If you search on the net, there were so many reports with different scenarios of falling from height which results to serious injuries and death. Most of the reports are fall from height in which elevator or lift shaft were left open or unprotected inside the construction building. "Elevator shaft falls are deadly, but it is preventable." How to prevent these lift shaft falls? Comply the OSHA fall protection standards. Main contractors shall design a fall protection system to prevent or reduce the risk of serious or fatal accidents. Conduct toolbox talks to workers & sub contractors of fall protection, work at height and highlight to them the possible hazards and how to identify prior working. Train them to recognize and avoid unsafe conditions. Provide the workforce with correct PPE (Personal Protective Equipment). In this case - the fall arrest sytem - and train them how to wear and use it properly. Conduct regular safety inspections throughout the construction building to ensure that the workplace are in safe condition. Ensure all workforce "know-what-to-do" during emergency. This is very important. Also, develop an emergency plan that reflect the response time from local emergency services. Here, you will find the elevator or lift shaft is fully protected with custom built and lockable lift shaft with protected cages. Workers who are working near the area will be protected from falling into the elevator shaft and the same working inside the shaft will be protected from falling materials. This must be done for all open lift shaft inside the construction building. Important Note: The key to the door must be kept only by the lift superintendent and the main contractor. 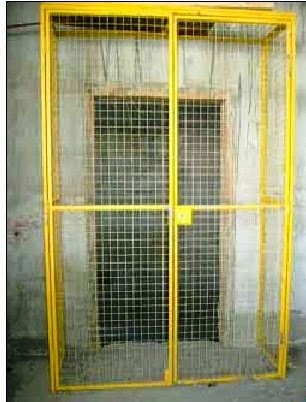 The steel cage will be fitted throughout the construction stage and to be removed only by the time the permanent lift doors will be installed and secured.